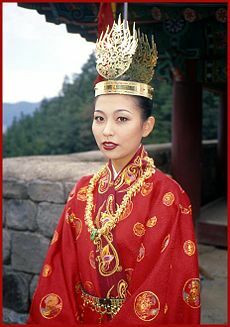 Re-enacted Queen wearing Baekje diadem ornament. Baekje (October 18 B.C.E. – August 660 C.E. ), a kingdom in the southwest of the Korean Peninsula originally named Sipje, comprised the Three Kingdoms of Korea together with Goguryeo and Silla. Baekje and Goguryeo both claimed descent from Buyeo, a state established in present-day Manchuria around the time of Gojoseon's fall. Goguryeo eventually defeated and absorbed Buyeo. Onjo of Baekje, the son of Goguryeo's founder Jumong, founded Baekje near present-day Seoul. 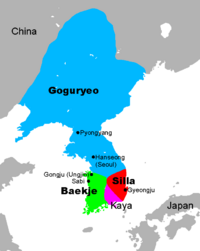 Baekje controlled most of the western Korean Peninsula as far north as Pyongyang in the fourth century, falling to alliance of Silla and the Tang Dynasty in 660, becoming part the Unified Silla dynasty. Baekje holds a unique position in Korean history by virtue of its influence on the creation of Korean and Japanese culture. The impact of China upon Korea and Japan has been long known and accepted by East Asian scholars. On the other hand, the impact of Korean upon Japanese civilization has been hotly contested by Korean and Japanese scholars. The evidence from documents and archaeological sites lends support to the claim that Baekje, and Korea in general, had a profound impact upon Japanese Buddhism and art. 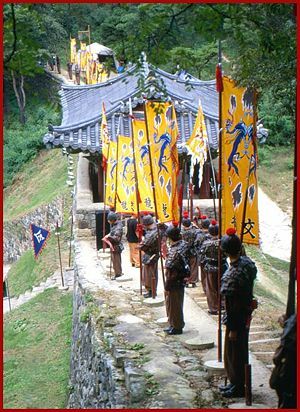 In the same way, Baekje had a profound impact upon the culture and religion of the Unified Silla dynasty. According to the Samguk Sagi, King Onjo, who led a group of people from Goguryeo to the Han River region of Korea founded Baekje in 18 B.C.E. According to the Chinese record San Guo Zhi, during the Samhan period, one of the chiefdoms of the Mahan confederacy in the Han River basin was called Baekje. The Samguk Sagi provides a detailed account of Baekje's founding. Jumong had left his son Yuri in Buyeo when he left that kingdom to establish the new kingdom of Goguryeo. Jumong became King Dongmyeongseong, and had two sons, Onjo and Biryu, by a new queen. When Yuri later arrived in Goguryeo, Jumong promptly made him the crown prince. Realizing Yuri would become the next king, Onjo and Biryu decided to head south with their people, along with ten vassals. Onjo settled in Wiryeseong (present-day Seoul), and called his country Sipje (meaning "Ten Vassals"), while Biryu settle in Michuhol (present-day Incheon), against the vassals' advice. The salty water and marshes in Michuhol made settlement difficult, while the people of Wiryeseong lived prosperously. In shame, Biryu committed suicide, and his people moved to Wiryeseong, where King Onjo welcomed them and renamed his country Baekje ("Hundred Vassals"). King Onjo moved the capital from the south to the north of the Han River, and then south again, probably all within present Seoul, under pressure from other Mahan states. Evidence suggests that King Gaeru moved the capital to the Bukhan Mountain Fortress in 132 C.E., probably in present-day Gwangju City (Gyeonggi), to the southeast of Seoul. Through the early centuries of the Common Era, sometimes called the Proto-Three Kingdoms Period, Baekje gradually gained control over the other Mahan tribes. During the reign of King Goi (234–286), Baekje became a full-fledged kingdom, continuing consolidation of the Mahan confederacy. In 249, according to the Japanese chronicle Nihonshoki, Baekje's expansion reached the Gaya confederacy to its east, around the Nakdong River valley. Chinese records first described Baekje as a kingdom in 345. King Geunchogo (346–375) expanded its territory to the north through war against Goguryeo, while annexing the remaining Mahan societies in the south. During Geunchogo's reign, the territories of Baekje included most of the western Korean Peninsula (except the two Pyeongan provinces), and in 371, Baekje defeated Goguryeo at Pyongyang. Baekje continued substantial trade with Goguryeo, and actively adopted Chinese culture and technology. Buddhism became the official state religion in 384. Baekje also became a sea power and continued mutual goodwill relationships with the Japanese rulers of the Yamato period, transmitting cultural influences to Japan. Chinese writing system, Buddhism, advanced pottery, ceremonial burial, and other aspects of culture were introduced by aristocrats, artisans, scholars, and monks from Baekje throughout their relationship. During this period, the Han River basin remained the heartland of the country. 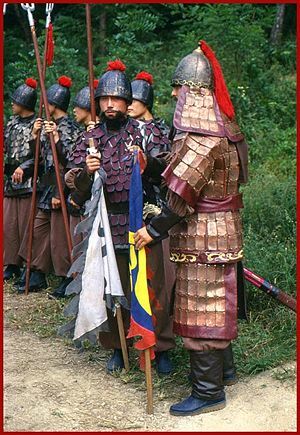 In the fifth century, Baekje retreated under the southward military threat of Goguryeo, the Seoul region falling to Goguryeoin in 475. Baekje moved its capital southward to Ungjin. Isolated in mountainous terrain, the new capital stood secure against the north but also disconnected from the outside world. Baekje, allied more closely to Silla than Wiryeseong, formed a military alliance with Silla to stand against Goguryeo. Most maps of the Three Kingdoms period show Baekje occupying the Chungcheong and Jeolla provinces, the core of the country in the Ungjin and Sabi periods. Baekje established its capital at Sabi (present-day Buyeo County) from 538 to 660. In 538, King Seong moved the capital to Sabi (in modern-day Buyeo County), and rebuilt his kingdom into a strong state. From that time, Nambuyeo ("South Buyeo") became the official name of the country, a reference to Buyeo (state) to which Baekje traced its origins. The Sabi Period witnessed the flowering of Baekje culture, alongside the growth of Buddhism. Seong sought to strengthen Baekje's relationship with China. The location of Sabi, on the navigable Geum River, made contact with China much easier, and both trade and diplomacy flourished during the sixth century and seventh century. The Sabi period also marked less friendly relations with Silla. In the seventh century, with the growing influence of Silla in the southern and central Korean peninsula, Baekje began to decline. In 660, the coalition troops of Silla and Tang of China attacked Baekje. The capital Sabi eventually fell, resulting in the annexation of Baekje by Silla. King Uija and his son went into exile in China while some of the royals probably fled to Japan. Baekje forces attempted a brief restoration movement, but faced Silla-Tang joint forces of 130,000 men. General Boksin proclaimed Prince Buyeo Pung as the new king of Baekje, called King Pungjang. Baekje requested Japanese aid, and Prince Naka no Ōe, later Emperor Tenji, dispatched an army contingent led by Abe no Hirafu to Korea. Before the ships from Japan arrived, his forces harassed a contingent of Tang forces in Ungjin County. In 663, Baekje revival forces and a Japanese naval fleet convened in southern Baekje to confront the Silla forces. The Tang dynasty also sent 7000 soldiers and 170 ships. After five naval confrontations that took place in August 663 at Baekgang, considered the lower reaches of Tongjin river, the Silla-Tang forces emerged victorious. Most scholars trace the establishment of a centralized state in Baekje to the reign of King Goi, who may have first established patrilineal succession. Like most monarchies, aristocracy held a great deal of power. King Seong, for example, strengthened royal power, but when slain during a disastrous campaign against Silla, the nobles took much of that power away from his son. 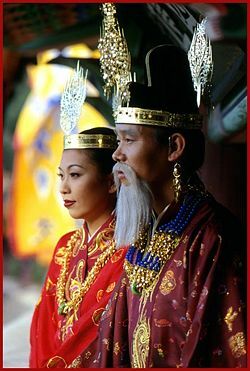 Hae clan and Jin clan emerged as the representative royal houses who had considerable power from the early period of Baekje, and they produced many queens over several generations. The Hae clan probably became the royal house before the Buyeo clan replaced them, and both clans appear descended from the lineage of Buyeo and Goguryeo. 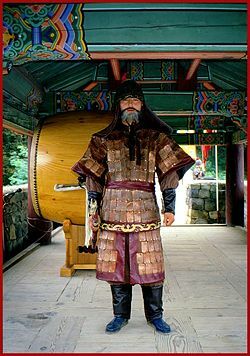 The eight clans: Sa, Yeon, Hyeop, Hae, Jin, Guk, Mok, and Baek, fielded powerful nobles in the Sabi era, and Chinese records such as Tongjeon mention those clans. Central government officials fell into 16 ranks, the six members of the top rank forming a type of cabinet, with the top official being elected every three years. In the Sol rank, the first (Jwapyeong) through the sixth (Naesol) officials constituted political, administrative, and military commanders. 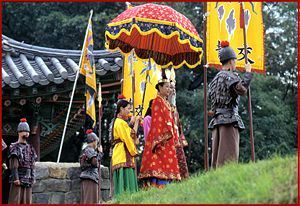 In the Deok rank, the seventh (Jangdeok) through the eleventh (Daedeok) officials may have headed each field. Mundok, Mudok, Jwagun, Jinmu and Geuku from the twelfth to the sixteenth, may have been military administrators. 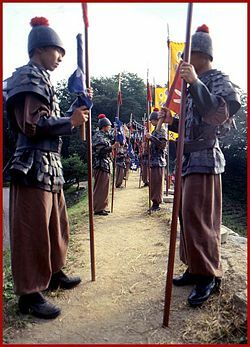 Officials in the rank of Sol dressed in purple, the rank of Deok dressed in red, and Mundok and below wore blue court clothing. According to the Samguk Yusa, during the Sabi period, the government chose the chief minister (Jaesang) of Baekje in a unique way. They placed the names of several candidates under a rock (Cheonjeongdae) near Hoamsa temple. After a few days, officials moved the rock. They selected as the new chief minister the candidate whose name had a certain mark. Whether a form of selection-by-lot or a covert selection by the elite is unclear. Immigrants from Goguryeo who spoke a Buyeo language, a hypothetical group linking the languages of Gojoseon, Buyeo, Goguryeo, Baekje, and early Japanese established Baekje. The indigenous Samhan people, having migrated in an earlier wave from the same region, probably spoke a variation or dialect of the same language. Baekje artists adopted many Chinese influences and synthesized them into a unique artistic tradition. Buddhist themes prevade in Baekje artwork. The beatific "Baekje smile" found on many Buddhist sculptures expresses the warmth typical of Baekje art. In addition, Daoist and other Chinese influences dominated. The Liang Dynasty sent Chinese artisans to the kingdom in 541, giving rise to increasing Chinese influence during the Sabi period. The tomb of King Muryeong (501–523), although modelled on Chinese brick tombs and yielding some imported Chinese objects, contained many funerary objects of the Baekje tradition, such as the gold diadem ornaments, gold belts, and gold earrings. Mortuary practices followed the unique tradition of Baekje. Archeologists consider that tomb a representative tomb of the Ungjin period. Delicate lotus designs of the roof-tiles, intricate brick patterns, curves of the pottery style, and flowing and elegant epitaph writing characterize Baekje culture. The Buddhist sculptures and refined pagodas reflect religion-inspired creativity. A splendid gilt-bronze incense burner (백제금동대향로) excavated from an ancient Buddhist temple site at Neungsan-ri, Buyeo County, exemplifies Baekje art. 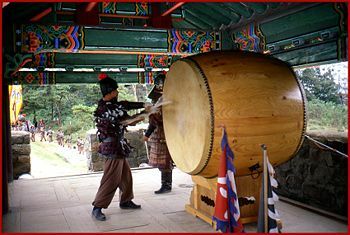 Little is known of Baekje music, but the royal courts sent local musicians with tribute missions to China in the seventh century, indicating that a distinctive musical tradition had developed by that time. In 372, King Geunchogo paid tribute to the Jìn Dynasty (265-420), located in the basin of the Yangtze River. After the fall of Jin and the establishment of Liu Song Dynasty in 420, Baekje sent envoys seeking cultural goods and technologies. Baekje sent an envoy to Northern Wei of Northern Dynasties for the first time in 472, and King Gaero asked for military aid to attack Goguryeo. Kings Muryeong Seong sent envoys to Liang several times and received titles of nobility. Craftsmen built the Tomb of King Muryeong using bricks according with Liang's tomb style. To confront with the military pressure of Goguryeo and Silla, Baekje, known as Kudara in Japanese, established close relations with the Japanese kingdom of Wa. According to the Korean chronicle Samguk Sagi, King Asin sent his son Jeonji as a hostage in 397. In exchange, Japan provided military support. The Samguk Sagi and Samguk Yusa cite Baekje royalty and nobility as influential dignitaries in the Wa court. 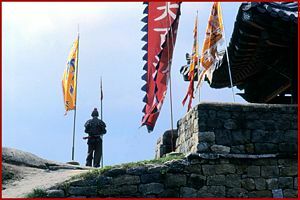 Baekje maintained influence in Japan and ensured the continuation of the Yamato alliance with Baekje, as in the time of Emperor Yomei when the Buddhist constructed the temple of Horyuji. Scholars maintain that Muryeong of Baekje, the twenty-fifth king, had been born in Japan. Baekje's influence upon Japanese culture during the Yamato period has been a contentious issue in contemporary relations between South Korea and Japan. The exact nature of the relationship has been undergoing continual investigation with some scholars considering Yamato an extension/colony of Baekje's expansion efforts. Japanese scholars usually claim the opposite relationship. Soga no Koma (蘇我高麗) in Japan, the father of influential Soga no Iname, referred to using the same Chinese characters as the abbreviation for Goguryeo (高麗). Soga no Iname promoted Korean Buddhism in Japan. Koma's name could also be a reference to the royals castles of Baekje, called "Goma" or Koma. Soga no Koma's father had been, reportedly Soga no Karako (蘇我韓子), Kara meaning Korea, and the same Chinese character for Korea as used today. Other Soga clan's names implying possible Korean ancestry/involvement include Karako's uncle, Kose no O Kara Sukune (巨勢雄柄宿禰), the O-Kara means King of Korea in Japanese. Soga no Emishi, great-grandson of Soga no Koma, trying to take over the Imperial throne, had been assasinated in 645.Possibly their arch rivals, the Nakatomi clan and Emperor, wanted to "clean history" by destroying the Kojiki, erasing the Soga's Korean royal lineage by changing the meaning of the Chinese characters to write O-Kara, especially with the attempted coup so fresh in their memory. From the attempted coup in 645 to the fall of Baekje in 660 spans only 15 years, so Japan's souring of relations with Baekje could have precipitated a final nail in Baekje's coffin. Japanese scholars came to Baekje for education and culture, while Baekje scholars, architects, sculptors and potters and immigrants went to Japan, contributing much to the development of Japanese culture, religion, and technology. Baekje immigrants helped spread the kanji and loanwords in Japan. Some members of the Baekje nobility and royalty fled to Japan even before the overthrow of the kingdom. According to Shoku Nihongi, Takano no Niigasa (高野新笠, ?–790), the birth mother of Emperor Kammu of Japan, belonged to the pedigree of Muryeong of Baekje (462–523). After Baekje's fall in 663, Japan sent the general Abe no Hirafu with twenty thousand troops and one thousand ships to revive Baekje with Buyeo Pung (known in Japanese as Hōshō), a son of Uija of Baekje who had been an emissary to Japan. Around August of 661, ten thousand soldiers and 170 ships, led by Abe no Hirafu, arrived. Additional Japanese reinforcement, including 27,000 soldiers led by Kamitsukeno no Kimi Wakako and 10,000 soldiers led by Iohara no Kimi also arrived at Baekje in 662. That attempt failed at the battle of Baekgang, the prince falling slain on the battle field. Only half of the troops survived to return to Japan. According to the Nihonshoki, Japan lost 400 ships in the war. The Japanese army retreated to Japan with many Baekje refugees. Buyeo Pung's younger brother Zenkō (善光 or 禅広) served for Japan and received the family name Kudara no Konikishi (百濟王) from the emperor of Japan. Baekje revived briefly, as in the Later Three Kingdoms, as Unified Silla collapsed. In 892, General Gyeon Hwon established Hubaekje (“Later Baekje”), based in Wansan (present-day Jeonju). King Taejo of Goryeo overthrew Hubaekje in 936. 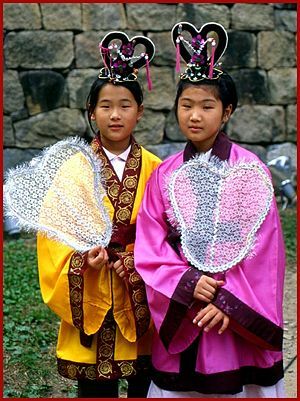 In contemporary South Korea, Baekje relics are often symbolic of the local cultures of the southwest, especially in Chungnam and Jeolla. The gilt-bronze incense burner, for example, is a key symbol of Buyeo County, and the Baekje-era Buddhist rock sculpture of Seosan Maaesamjonbulsang is an important symbol of Seosan City. Although controversial, some Chinese and Korean records indicate that Baekje territory included parts of present-day China, across the Yellow Sea. According to the Book of Song, “Goguryeo came to conquer and occupy Liaodong, and Baekje came to occupy Liaoxi (遼西) (in modern Tangshan, Hebei); the place that came to be governed by Baekje was called the Jinping District, Jinping Province.” (宋書 列傳 夷蠻 東夷 百濟國 高麗略有遼東 百濟略有遼西 百濟所治 謂之晋平郡晋平縣) The records of Book of Jin on Murong Huang states that the alliance of Goguryeo, Baekje, and a Xianbei tribe took military action. (三國史記 高句麗本紀 美川王 十四年 侵樂浪郡 十五年… 南侵帶方郡 二十年 我及殷氏宇文氏 使共攻慕容廆 二十一年… 遣兵寇遼東 晋書卷一百九 載記第九 慕容皝 句麗百濟及宇文殷部之人 皆兵勢所徙) The Samguk Sagi records that those battles occurred during the reign of King Micheon of Goguryeo (309-331). According to the Book of Liang, “during the time of Jin Dynasty (265-420), Goguryeo conquered Liaodong, and Baekje also occupied Liaoxi and Jinping, and established the Baekje provinces.” (梁書 列傳 東夷 百濟 晋世句麗旣略有遼東 百濟亦據有遼西 晋平二郡地矣 自置百濟郡) The Zizhi Tongjian, compiled by Sima Guang (1019-1086) of the Song Dynasty (960-1279), states that in 346, Baekje invaded Buyeo, located at Lushan, and as a result the people of the country scattered westward toward Yan. (資治通鑑 晋紀 穆帝 永和二年 春正月… 初 夫餘居于鹿山 爲百濟所侵 部落衰散 西徙近燕 而不設備 燕王皝 遣世子儁 帥慕容軍 慕容恪 慕容根三將軍 萬七千騎 襲夫餘 (二: 326)) That happened during the first year of the King Geunchogo’s reign (346-375) in Baekje. 南齊書 列傳 東夷 百濟國 魏虜又發騎數十萬攻百濟入其界 牟大遣將… 率衆襲擊虜軍 大破之 建武二年 牟大遣使上表曰… 臣遣… 等領軍逆討 三國史記 百濟本紀 東城王 十年 魏遣兵來伐 爲我所敗). Since an army traveling from northern China to the southwestern corner of the Korean peninsula had to pass through the hostile and powerful Goguryeo (in the reign of King Jangsu of Goguryeo (413-491)), a lack of mention in the contemporary chronicles means that the “Baekje” in those records must refer to Baekje's presence on the other side of Goguryeo, in Liaoxi. The Book of Qi also records that in 495 Baekje's King Dongseong requested honorary titles for the generals who repulsed the Wei attack. The titles given by the Southern Qi court carried the names of their domains that sounded like some Liaoxi areas, such as Guangling, Qinghe, Chengyang, etc. The boundary of Baekje begins from the present-day Guangning and Jinyi provinces in the northwest and then crosses the sea in an easterly direction to arrive at the Joseon’s Hwanghae, Chungcheong, Jeolla, etc. provinces. Running east to west, Baekje’s territory is narrow; running north to south, it is long. Thus it occurs that if one looks at Baekje’s territory from the Liucheng and Beiping area, Silla is located in the southeast of Baekje, but if one looks from the Gyeongsang and Ungjin area of Baekje, Silla is located in the northeast. Baekje also borders Mohe in the north. Its royal capital has two castles at two different places in the east and west. Both castles are called “Goma.” The Book of Song says that the place governed by Baekje was called the Jinping district of the Jinping province. Tong-gao says that the the Jinping province was located between Liucheng and Beiping of the Tang period. (欽定 滿洲源流考 卷三 部族 百濟 … 通典 [卷一百八十五 邊方典一]… 晋時句麗旣略有遼東 百濟亦略有遼西晋平 唐柳城北平之閒 … 元史 … 唐柳城北平之間實今錦州) Hence Baekje had one capital located in “Liaoxi,” and the another inside the "Joseon" provinces. 新唐書 列傳 東夷 百濟 … 而其地已新羅及 渤海靺鞨所分 百濟遂絶). If Baekje was limited to the southwestern corner of the Korean peninsula, then it would have been impossible for the Balhae to occupy any of the old Baekje territories. The Silla scholar and alleged Sinocentrist Choi Chi-won (857-?) wrote that “Goguryeo and Baekje at the height of their strength maintained strong armies numbering one million persons, and invaded Wu and Yue in the south and You, Yan, Qi, and Lu in the north of the mainland China, making grave nuisances to the Middle Kingdom.” (三國史記 下 卷第四十六 列傳 第六 崔致遠 … 高麗百濟全盛之時 强兵百萬 南侵吳越 北撓幽燕齊魯 爲中國巨蠹). According to those records, Baekje must have held the Liao-xi province for more than a hundred years. 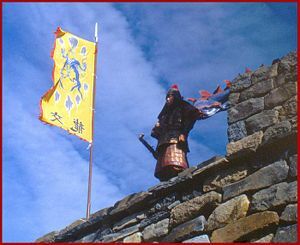 Photographs in this article, taken by Karsten Petersen at The Paekche Festival, year 2000, at Kongsansong Fortress in Kongju, Korea. All rights reserved by Karsten Petersen. Used by permission. Friday, Karl F. 1995. Delmer M. Brown, ed. The Cambridge History of Japan, Vol. 1. Ancient Japan. Cambridge: Cambridge University Press, 1993 ISBN 0521223520. Hong, Wontak. Paekche of Korea and the Origin of Yamato Japan. Seoul, Korea: Kudara International. 1994. ISBN 89855567020  Retrieved April 12, 2008. Korean Buddhism Basis of Japanese Buddhism, Seoul Times, June 18, 2006. 姜銓薰, 백제 대륙진출설의 제문제 (The Problem of Controlling Continent by Baekje), 韓國古代史論叢, 4, 392-450 (1992). Buddhist Art of Korea & Japan. This page was last modified on 6 May 2016, at 20:42.